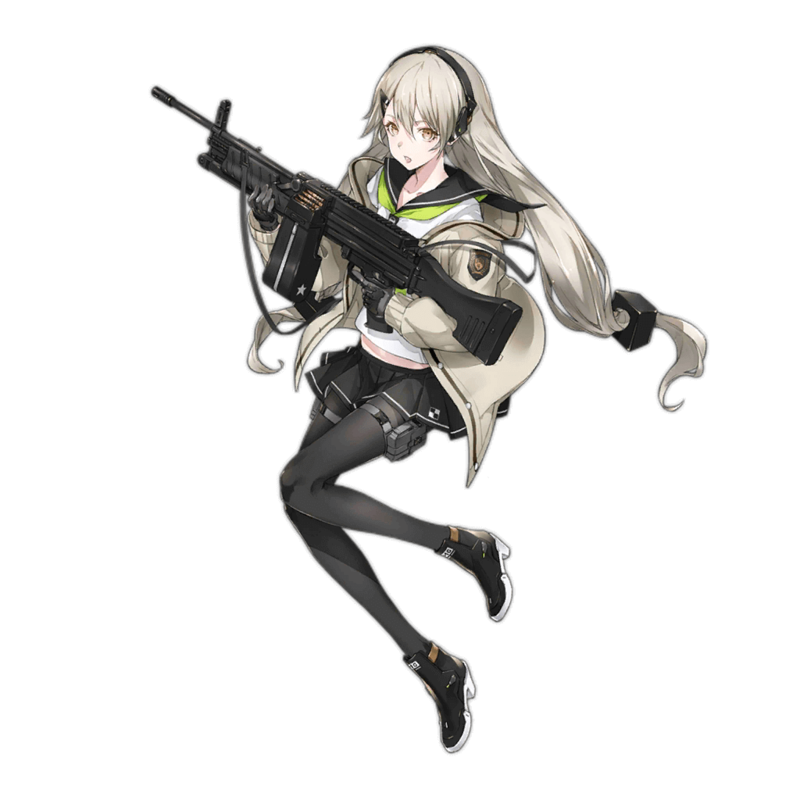 Almost everything about MG4 makes her an uncompelling choice of MG.
MG4’s decently high Accuracy allowing her to forgo an ITI Sight and equip EOT Sights, or even VFL Scopes at times. These two pieces of Equipment help her boost her Damage or Crit Rate, further boosting her damage output. MG4’s buff tile offers the second highest boost to Armor in the game after Negev, and Armor buffs are the only buffs that make an impact on SGs. While MG4’s Skill itself isn’t the worst, as it has an Initial Cooldown of 8 seconds, it rarely gets to see use. MG4 has an abysmal Damage stat, which makes her DPS a lot lower than it needs to be. The first quality that makes MG4 ineffective is her terrible stat distribution. MG4 has one of the highest RoF and Evasion out of MGs, both of which are useless stats for MGs. In exchange for high values in these two stats, MG4 has low Damage, which is one of the most important stats for MGs. Additionally, while other 5 star MGs have 11 shots per volley, MG4 only has 9, which significantly decreases her per-volley damage output. MG4’s stats do have a positive aspect, that being her Accuracy. MG4 has a high Accuracy at 34, which allows her to use different accessories compared to other MGs to increase her Damage and Crit Rate. The difference in DPS made by these pieces of Equipment, however, isn’t anywhere enough to make up for the loss in DPS caused by her other lacking stats. The second quality that makes MG4 ineffective is her Skill. The buff the Skill provides isn’t terrible by itself -- granting MG4 4 additional ammo per volley and a 35% Damage buff -- but its 8 second Initial Cooldown and short 8 second uptime means it will only activate in her second volley and therefore won’t see use in most battles.. Since most battles involving MGs end within one volley and long battles involving MGs usually end in three volleys, the fact that MG4’s Skill activates so late makes it awkward to use regardless of the circumstances. One thing to note about MG4 is that she has the second highest Armor tile buff in the game, offering a 15% buff to Armor. Due to this, she is sometimes -- though very rarely -- used in Echelons in order to boost a tank’s Armor as much as possible. In long battles against enemies with high Damage, MG4’s Armor buff can compensate for her other weaknesses, though not by much. As MG4 still deals pitiful damage, though, it’s almost always still a better choice to use an MG that can deal more damage and has a weaker tile buff, or even another MG that just deals more damage, entirely forgoing the Armor tile. While Armor tiles make a good MG’s kit even better, it isn’t a good enough feature to save MG4. Overall, MG4 is one of the worst units in the game, with no distinct specialties and weaknesses that far outscale her strengths. In almost every circumstance, it’s advisable to use another MG altogether. Like all MGs, MG4 gets the most mileage out of Accuracy and Damage buffs. As MG4 has a low base Damage stat, Damage buffs are favored. Some examples are KSG and M37. Likewise, MG4 appreciates Accuracy and Damage buffs from HGs.. As MG4 has high Accuracy and low Damage, however, she prefers Damage buffs. HGs that could be used with her are SAA, Mk23, and Grizzly. 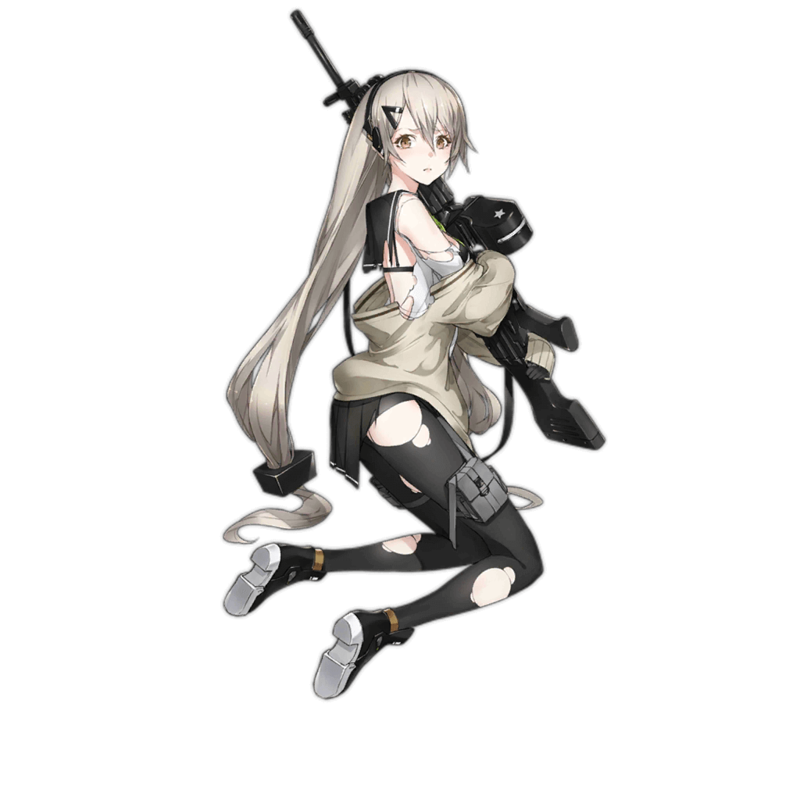 As with all MGs, it doesn’t matter which MGs MG4 is paired with -- it should be considered, however, that as MG4 deals little damage by herself, she should be put with stronger MGs in order to compensate. PKP, MG5, and PK are good partners for her. In a typical 1SG echelon, MG4 can either be placed at the top left or the bottom left, as either way her buffs reach the SG. In a typical 2SG echelon, MG4 can be placed in the middle left in order to grant both SGs Armor buffs. Instead of using three MG in the backline, an HG can be used in the middle column instead as MG4 takes up the slot normally occupied by the HG. The Heckler & Koch MG4 started development in 1990, and was first publicly released in 2001. It was designed in order to be as flexible as possible , and was manufactured to be light and durable so that it could function in a variety of conditions. It is also able to support multiple types of ammunition from different manufacturers, further adding to its versatility.